The Avid FX interface used in Avid Media Composer. 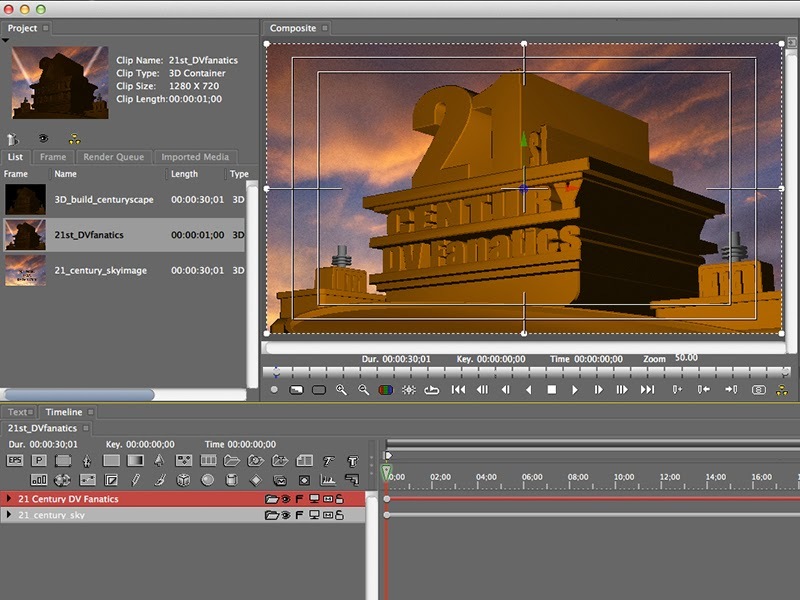 Last week we used Adobe After Effects to build a film open in Dissecting the Video: 20th Century Fox Open. I had originally tried creating the same 20th Century Fox build in Avid FX, but I ran into some issues. This week I'll discuss some of the frustrations I ran into, and why most of those frustrations come from being used to the way Adobe After Effects works. The following are some of the ways Avid FX behaves differently from Adobe After Effects and the ways to overcome those differences. Initially one of my biggest frustrations with Avid FX was how it automatically adds keyframes whenever an adjustment is made to a layer. Turns out, this was a case of user error. I was not aware of how keyframimg in Avid FX is supposed to work. After watching Keyframing Basics in Avid FX on Boris TV, I finally understood that I had long been overlooking a simple button that made the world of difference to me - the Toggle Animate/Static Mode button. Making sure this button was off (gray) meant I could make all the adjustments I wanted to a layer and it would affect the layer throughout the sequence. 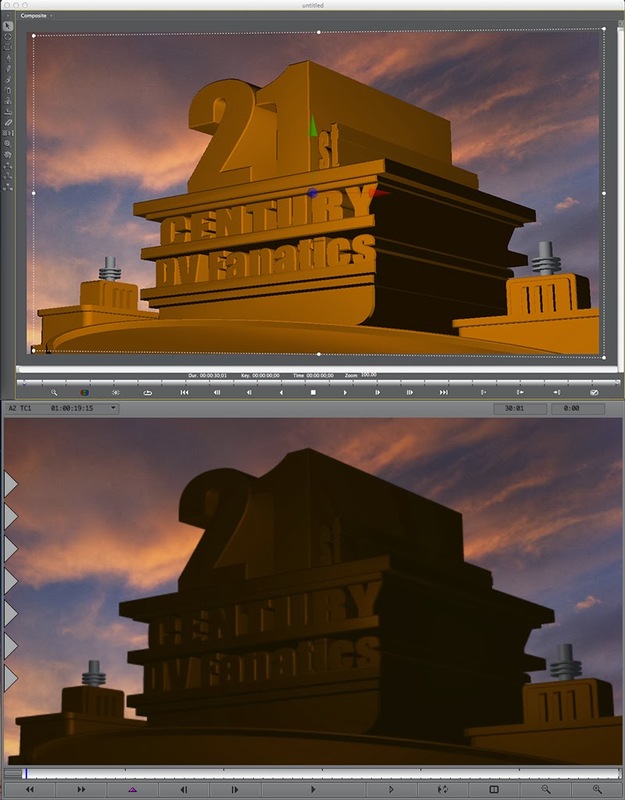 Unfortunately, there are no dedicated layers in Avid FX for adding effects over the top of the whole composite. It seems like the only way to add effects over a foreground and a background, is to create a solid, add the effect to that layer and then key out the background color. There may be a more elegant workaround, but I have yet to find it. There are some general flakiness issues, I will have to live with when using Avid FX. I know that I had to deal with layers disappearing from view at times. It required me to Refresh View in order for me to get them back. Avid FX seems to crash more than other applications, but it may be because I was pushing it beyond its "comfort zone". The reason I was using Avid FX to build the 20th Century Fox open is because Avid FX is able to extrude objects in 3D space and remain much more responsive than Adobe After Effects. Avid FX - top, Avid Media Composer - bottom. Another major frustration that I experienced was a lighting shift between the Avid FX interface and the Avid Media Composer. I'm not sure how to resolve this other than adding too much light in Avid FX and then seeing what it looks like back in Avid Media Composer. This may be limited to working in the 3D space with more complex 3D objects. I don't see this with simple extruded text, but when creating the 20th Century Fox animation, there was a huge lighting shift between the Avid FX interface and the Avid timeline. If there are a lot of Avid FX users out there, they keep pretty much to themselves. If you need to find an answer about Avid Media Composer, Adobe After Effects or Adobe Premiere Pro there are plenty of places to go. Not only are there community forums or LinkedIn and Facebook discussion groups, but typing your question into Google always yields a bounty of excellent advice. The same isn't true for Avid FX. There are resources, such as Boris TV, which I previously mentioned, but it takes much more effort to find info. As an additional resource, I have posted a collection of Avid FX Transitions to the following link - Avid FX Templates. Check out my other blog about Avid FX at this link - Avid FX (Boris RED) in Avid Media Composer. Great blog post. I've had to deal with some of the same frustrations with this software. The one thing that bothers me the most is that Boris make zero effort to make this software easier to learn. It comes free with Media Composer and to me it seems to have great potential but the amount of tutorials out there is just too little. If I was BorisFX I would make a whole series of great tutorials covering everything from the basics to really complex compositions. Thanks. I agree - it's relatively hard to find information about Avid FX out there. Unfortunately Avid FX is no longer going to be a core part of the Avid Media Composer going forward (v8.x), so that limits its usability somewhat. I guess that's the risk of using 3rd-party plugins - Avid FX is actually a Boris RED AVX plugin.